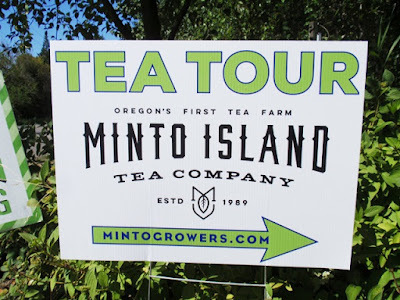 On July 30th, I attended one of the first public tours of Minto Island Tea Company. The tea farm is located in South Salem near Minto Brown Island Park. 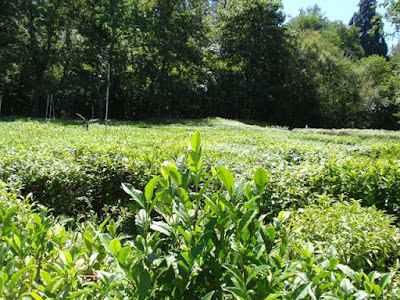 It's exciting to learn about tea growers in North America, and even more so when one of the more successful tea farms happens to be located near my hometown! 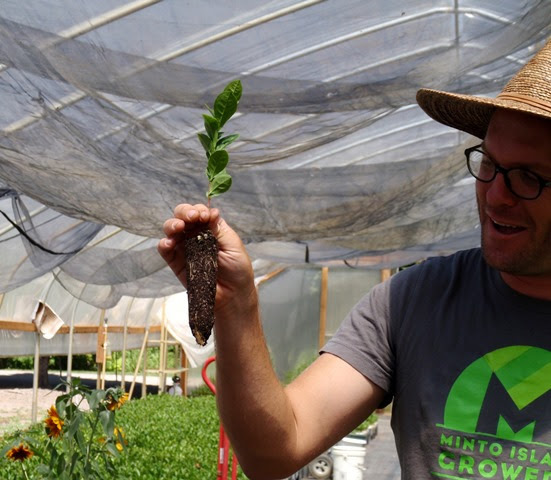 Minto Island Growers is a 40-acre organic CSA (Community Supported Agriculture) farm and nursery, operated by co-owners Chris Jenkins and Elizabeth Miller. The half-acre tea garden was planted in 1988 by Elizabeth's father, Rob Miller, with plants collected by partner and agricultural consultant John Vendeland as an experiment to prove that tea can be grown successfully in the Northwest. 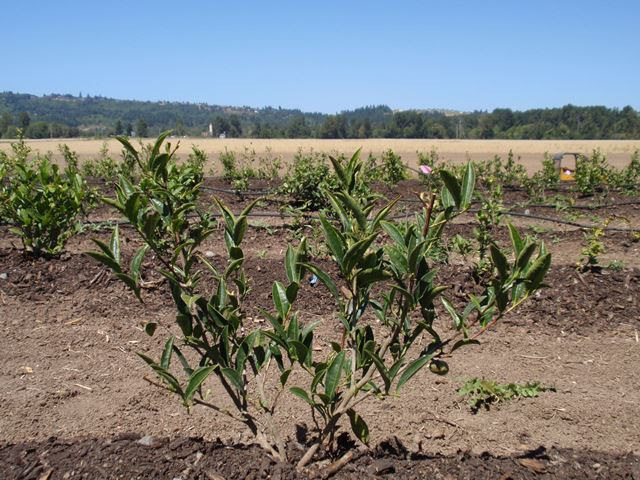 The soil on the farm is fertile due to seasonal flooding and irrigation provides much-needed water during dry Oregon summers. Tea is harvested May through September and the plants are generally dormant the rest of the year. All tea is handpicked, though they are hoping to introduce small-scale mechanization soon. 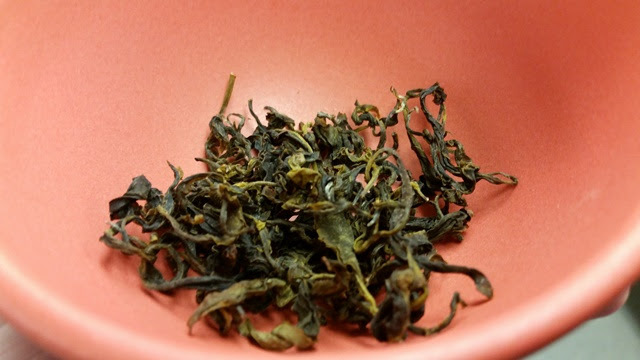 Currently, Minto Island Tea Company is producing green, oolong, and black tea. 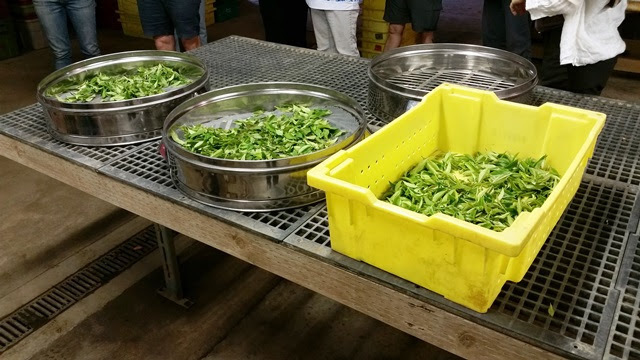 The tour began with a visit to the original tea plot where Chris and Elizabeth provided information about the history and development of the tea garden, cultivars, and harvesting methods. 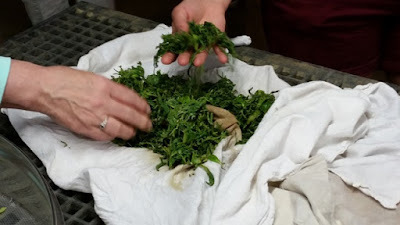 We had the opportunity to pluck tea before moving inside to compare the freshly picked leaves to leaves that had been withering for three hours. The withered leaves had become soft and malleable, ideal for rolling. After plucking and withering, the leaves will be rolled, then steamed or fired (depending on the tea being produced) to reduce the moisture content to 3-5%. Chris demonstrated the labor-intensive process of hand-rolling green tea. This is generally done on a larger scale though still by hand. Historically, tea plants were grown from seeds which will have been cross-pollinated from a variety of donors. The seedling will produce a long taproot from which smaller roots will branch out. 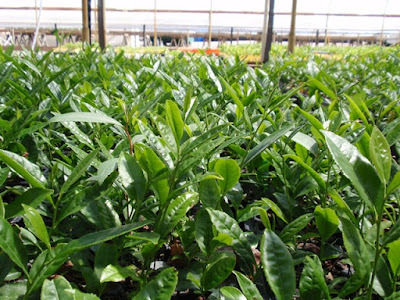 More recently, tea is produced from cuttings which results in genetically identical, clonal tea plants. These plants do not have taproots and instead produce net-like roots that spread shallowly. 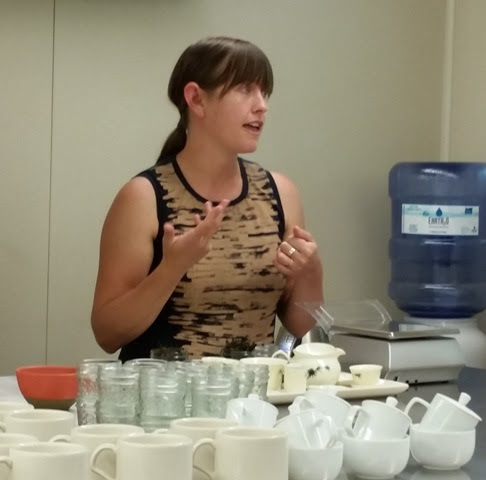 Our next stop was the kitchen for a green tea tasting. Elizabeth walked us through a modified cupping and gongfu tea preparation where attendees could see, smell, taste, and compare the dry and infused leaves. 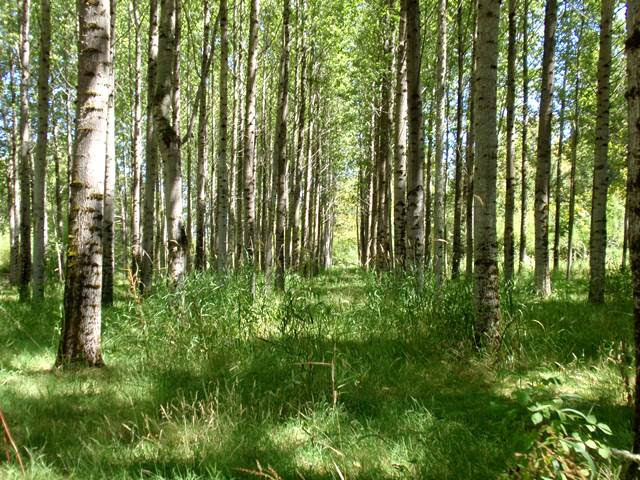 Following the tea tasting, we took a scenic walk to the farm stand through an area filled with lush green plants and trees, including an experimental poplar grove, where an unusually large variety of birds make their permanent and seasonal homes. 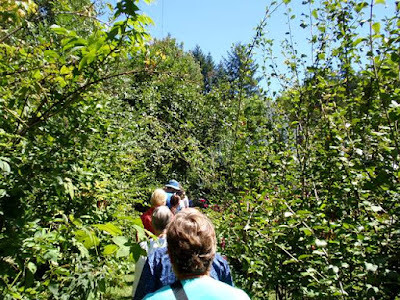 The local branch of the Audubon Society holds tours in the area, for anyone interested in joining. 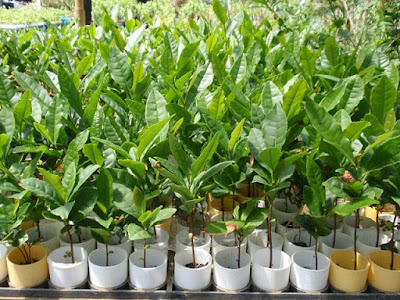 Next, we visited one of several tea plots where the affects of soil variations and elevation on tea plant growth and viability are studied. The tour concluded at the farm stand where seasonal fruits and vegetables, tea, and fresh-made food are available for purchase. 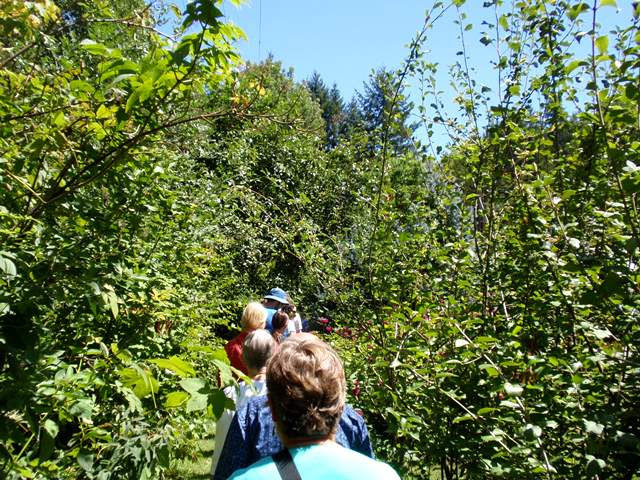 The next and final tea tour of the year will take place on August 20th and tickets may be purchased online. Chris and Elizabeth plan to offer an open house and two tea tours again in 2017. Sign up for their newsletter to hear about news and upcoming events. 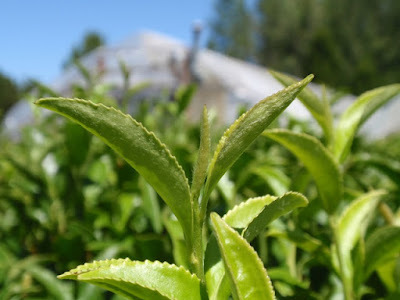 Minto Island teas are available for purchase (while supplies last) online, at the Portland Farmers Market, and at the Minto Island Farm Stand where you can also purchase tea plants. Funny you should mention John Vendeland. I actually met him up in Burlington some three years back at Sakuma's old garden, purely by happenstance. I've been meaning to visit Sakuma if/when a tour becomes available. 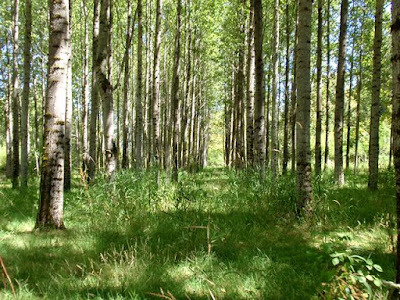 Their plants originated from Minto which is where the Vendeland connection comes in. 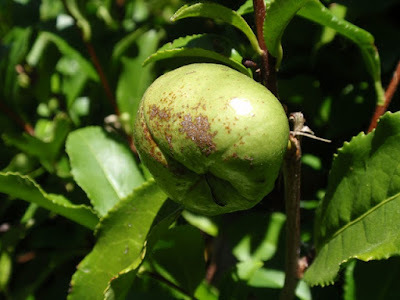 I'm wondering if there's a similar connection to the Vancouver tea farm. Related: A Minto tea plant followed me home.